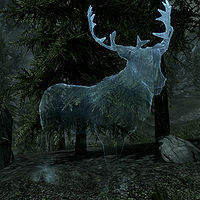 The Aspect of Hircine is a spectral stag, and the form in which Hircine appears to the player. It appears throughout the quest Ill Met by Moonlight. Ill Met By Moonlight: Hunt in the name of the Daedric Prince, Hircine. The humanoid Aspect of Hircine that appears if you kill Sinding has a RefID of 00015c67. This page was last modified on 19 May 2015, at 21:05.